Here you can download our Prospectus, which also has all the forms you will need to register your child. Uniforms are not compulsory but many parents find they are useful for keeping your children’s normal clothes free from mud, paint, food etc! 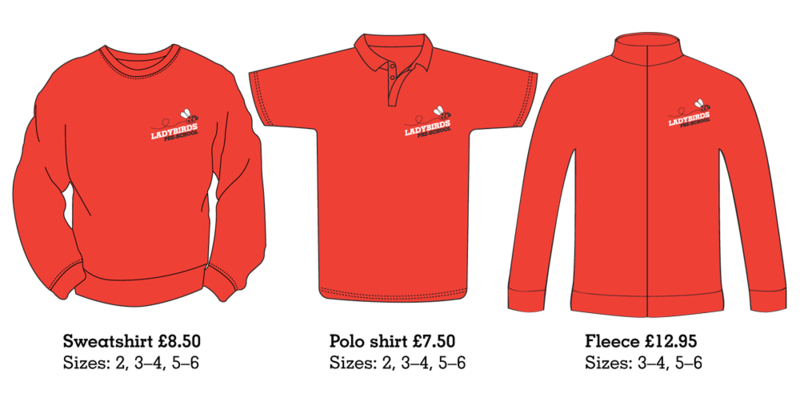 In addition to the Ladybirds sweatshirt and polo shirt, there is a warm and cosy fleece – perfect for the colder months! Please note the fleece is only available in sizes 3–4 and 5–6. The sweatshirt and polo shirt are available in sizes 2, 3–4 and 5–6. Uniforms are ordered directly from Needlepoint Designs in Sudbury. You can contact them on 01787 882341 or email sales@needlepoint.co.uk and let them know you would like to order uniform for Ladybirds Pre-school.